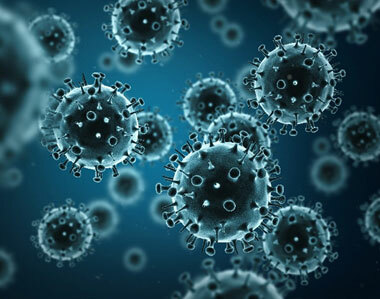 Nearly 10 percent of the human genome is derived from the genes of viruses. Credit: Stock image. When viruses infect us, they can embed small chunks of their genetic material in our DNA. Although infrequent, the incorporation of this material into the human genome has been occurring for millions of years. As a result of this ongoing process, viral genetic material comprises nearly 10 percent of the modern human genome. Over time, the vast majority of viral invaders populating our genome have mutated to the point that they no longer lead to active infections. But they are not entirely dormant. Sometimes, these stowaway sequences of viral genes, called “endogenous retroviruses” (ERVs), can contribute to the onset of diseases such as cancer. They can also make their hosts susceptible to infections from other viruses. However, scientists have identified numerous cases of viral hitchhikers bestowing crucial benefits to their human hosts—from protection against disease to shaping important aspects of human evolution, such as the ability to digest starch. Geneticists Cedric Feschotte , Edward Chuong and Nels Elde at the University of Utah have discovered that ERVs lodged in the human genome can jump start the immune system. An exhibit called “Minerals in Medicine” opened at the NIH Clinical Center last month (see slideshow). The display features a fascinating overview of how dozens of minerals are used to create drugs and medical instruments useful in treating disease and maintaining health. The minerals ranged from commonplace ones like quartz, which is used to make medical instruments, to more exotic ones like huebnerite, a source of the metal tungsten, which is used in radiation shielding. Fluorescent imaging of copper in white fat cells from mice. The left panel shows fat cells with normal levels of copper, and the right panel shows fat cells deficient in copper. Credit: Lakshmi Krishnamoorthy and Joseph Cotruvo Jr., University of California, Berkeley. What does a metal like copper have to do with our ability to breakdown fat? Researchers explored this question by observing mice with Wilson’s disease—a rare, inherited condition that causes copper to accumulate in the liver, brain and other vital organs. The mice with the condition usually have larger deposits of fat compared to healthy mice. To confirm that fat metabolism is somehow compromised in these mice, the researchers treated them with a drug that induces the breakdown of fat. And indeed they found that less fat was metabolized in mice with the disease. For several years, we’ve used this blog to highlight pictures we think are cool, scientifically relevant and visually striking. 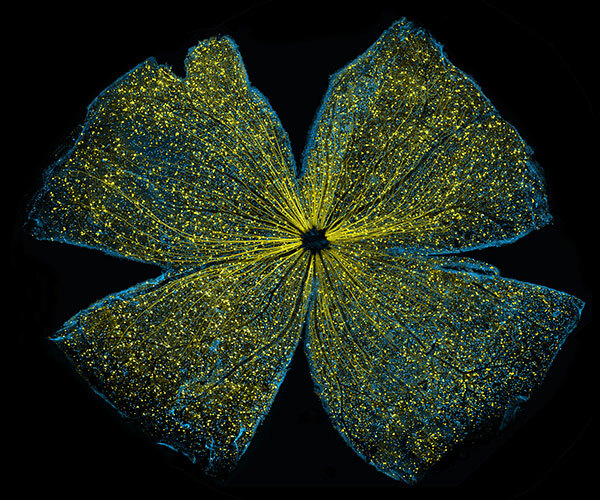 The images were created by NIGMS-funded researchers in the process of doing their research. Many come from our Life: Magnified collection, which features dozens of stunning photos of life, close-up. We’ll continue to bring you interesting images and information here on Biomedical Beat, but if you can’t get enough of them, we have a new way to share our visual content with you: Instagram. We’re pleased to announce the launch of our NIGMS Instagram account. 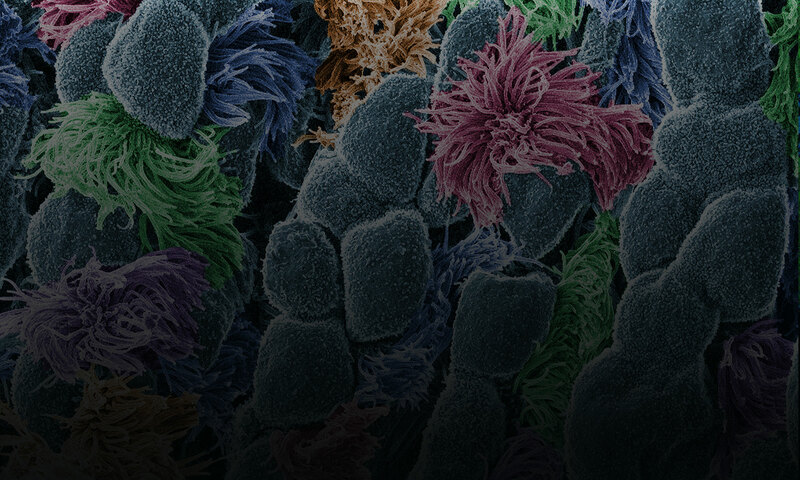 We’ll highlight gorgeous images, and bring you the science behind them—straight from our mobile device to yours. Instagram lets us label our images with subject-specific hashtags. You can find our pictures by going on Instagram and searching for #NIGMS. If you’re already an Instagram user, you can follow us @NIGMS_NIH. You can even see our page using a web browser at https://www.instagram.com/nigms_nih/ . Let us know what you think! Also, if you have any stunning images or videos that relate to scientific areas supported by NIGMS, please send them to us. They might end up on our Instagram feed! See those finger-like projections? They are called villi. 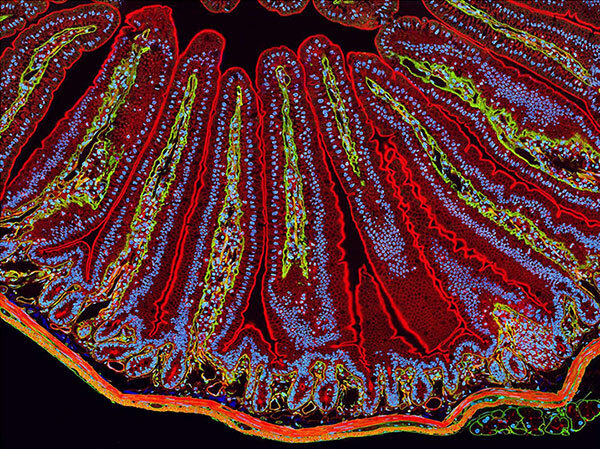 This image shows the small intestine, where most of the nutrients from the food we eat are absorbed into the bloodstream. The villi increase the organ’s surface area, making nutrient absorption more efficient. Credit: National Center for Microscopy and Imaging Research. We need zinc. It’s an essential nutrient for growth and development, fending off invading microbes, healing injuries, and all sorts of cellular processes. We get the mineral through our diet, but people in certain parts of the world don’t get enough. Researchers study how plants acquire and process zinc, hoping to find ways to increase the nutrient in food crops. 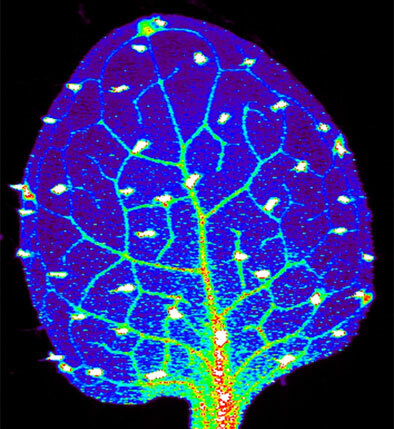 Using synchrotron X-ray fluorescence technology, scientists created this heat map of zinc in a leaf from a plant called Arabidopsis thaliana (zinc levels from lowest to highest: blue, green, red, white). Credit: Suzana Car and Mary Lou Guerinot, Dartmouth College. Scientists can learn a lot by studying pigment cells, which give animals their colorful skins, eyes, hair and scales. We can even gain insight into skin cancers, like melanoma, that originate from pigment cells. 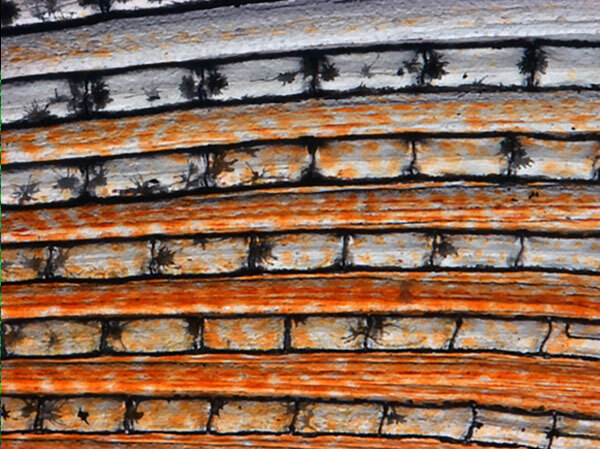 Pigment cells can form all sorts of patterns, like these stripes on the fin of a pearl danio, a type of tropical minnow. Credit: David Parichy, University of Washington. 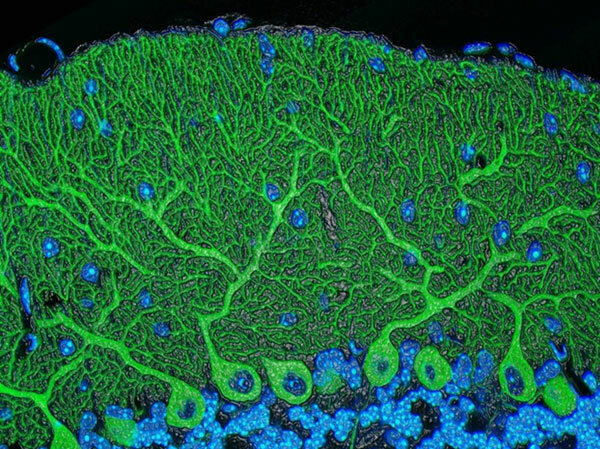 Retinal ganglion cells in the mouse retina that do (bright, yellow spots throughout) and do not (blue streaks, mostly along the edges) contain a specific gene that scientists introduced with a virus. Credit: Kenyoung (“Christine”) Kim, Wonkyu Ju and Mark Ellisman, National Center for Microscopy and Imaging Research, University of California, San Diego. What looks like the gossamer wings of a butterfly is actually the retina of a mouse, delicately snipped to lay flat and sparkling with fluorescent molecules. Researchers captured this image while investigating the promise of gene therapy for glaucoma, a progressive eye disease. It all happened at the National Center for Microscopy and Imaging Research (NCMIR) at the University of California, San Diego. Glaucoma is the leading cause of irreversible blindness. It is characterized by the slow, steady death of certain nerve cells in the retina. If scientists can prevent the death of these cells, which are called retinal ganglion cells, it might be possible to slow the progression of glaucoma. Some researchers are examining the possibility of using gene therapy to do just that.